Sunglass Huts: Giorgio Armani & Michael Kors — Geoff Howell Studio Inc. 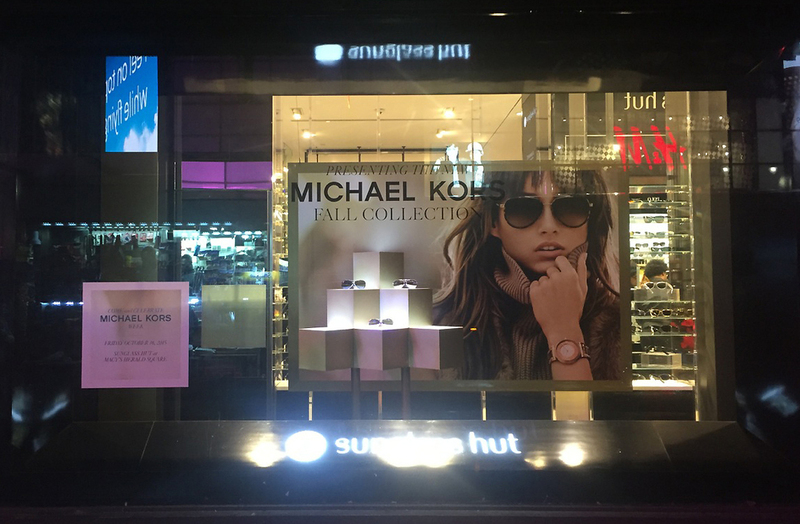 Here's a look at the latest round of Sunglass Hut windows we built props for, and installed, at Macy's Heralds Square and the 5th Avenue Sunglass Hut Flagship. The flagship store's Giorgio's Amrani's menswear collection which, in addition to the lightbox and graphics standards, included a custom-made 6 foot wide enlargement of the glasses in the collection, featuring a hand painted wood grain finish on plexi. For the Michael Kors windows at Macy's, floating stacked cubes provide the visual interest to showcase the sunglasses.